Sandusky, Ohio (November 9, 2015) - Capturing his fourth consecutive NASCAR Camping World Truck Series (NCWTS) top-10 finish last weekend at Texas Motor Speedway in Fort Worth, Sunoco Rookie of the Year contender, Cameron Hayley hopes his No. 13 Protect The Harvest Toyota Tundra will bring him some luck when the NCWTS invades Phoenix (Ariz.) International Raceway (PIR) on Friday the 13th for the Lucas Oil 150. Although Hayley will be making his 16th NCWTS track debut of the 2015 season, the Calgary, Alberta native is no stranger to PIR. With five previous starts at the one-mile oval in the K&N Pro Series West, Hayley has harnessed some experience in the "Valley of the Sun." Starting a track-best second in both 2013 races, and racing to three top-five finishes, including a runner-up finish in the 2013 spring race, the ThorSport Racing driver knows the keys to success at the Avondale, Arizona track. Aside from his previous success at PIR, Hayley has overcome his learning curve in the NCWTS throughout the 2015 season. Collecting four top-five and 12 top-10 finishes in just 21 starts, the 19-year old driver has completed 3146 of 3171 laps attempted (96%) en route to leading the ultra competitive NCWTS field for 78 circuits. Heading to PIR for the first time in his NCWTS career, just 20 points behind fifth place Timothy Peters in the NCWTS driver points standings, Hayley hopes to combine experience, and a little luck from his No.13 Toyota Tundra on the night of the 13th, to bring home his first win in his rookie season in the NCWTS Friday night. "I'm really looking forward to going back to Phoenix. I loved racing at Phoenix in the K&N Series. In fact, it was probably one of my favorite tracks we raced at. I think it will be a huge advantage for me to have that previous experience when I come back for the first time with the NCWTS. Plus, having all the experience I have gained in a truck this season, I think we're going to have a really good run there. It's nice to be back on the West Coast and race at such a different track. Phoenix has the long-straightaways, and tight turns, just a lot of things that make that track cool." Chassis Chatter... The No. 13 ThorSport Racing team will utilize chassis No. 36 for Friday night's Lucas Oil 150 at Phoenix International Raceway. This particular chassis has made two previous appearances in 2015, at Iowa Speedway in Newton, finishing 19th, and New Hampshire Motor Speedway in Loudon, finishing 12th. Phoenix Profile... Hayley will make his 16th NCWTS track debut of 2015 at Phoenix International Raceway Friday night. However, Hayley has raced on the one-mile track before, in the K&N Pro Series West. With five starts under his belt in the series, Hayley had a track-best starting position of second in both 2013 races, and three top-five finishes, including a runner-up finish in the spring race of 2013. Before 2015, Hayley had experience on three NCWTS tracks on the 2015 schedule; Canadian Tire Motorsports Park, Texas Motor Speedway and New Hampshire Motor Speedway. Season Review... After 21 races this season, Hayley has completed 3046 of 3171 laps attempted (96%), and led 78 laps en route to four top-five and 12 top-10 finishes. The ThorSport Racing driver currently has a season-best start of second, and a season-best finish of third at Martinsville (Va.) Speedway. In 2015, the ThorSport Racing driver has an Average Start of 8.4, and an Average Finish of 11.0. Previous Race Recap... Hayley qualified 14th for the WinStar World Casino 350k at Texas Motor Speedway, and raced to a 10th-place finish. Protect The Harvest was created to defend and preserve the freedoms of American consumers, farmers, ranchers, outdoor enthusiasts, and animal owners. For more information visit: www.ProtectTheHarvest.com. Fort Worth, TX (November 7, 2015) - Sunoco Rookie of the Year contender, Cameron Hayley continued to impress in Friday night's WinStar World Casino 350k at Texas Motor Speedway in Fort Worth. The ThorSport Racing driver topped the speed charts in final NASCAR Camping World Truck Series (NCWTS) practice on Thursday evening, qualified 14th for the 147-lap event, and led one lap en route to a 10th-place finish. The solid run was Hayley's fourth consecutive top-10 finish in the last four NCWTS races. Sandusky, Ohio (November 2, 2015) - Following a NASCAR Camping World Truck Series (NCWTS) career-best weekend in Martinsville (Va.) Speedway last weekend, Sunoco Rookie of the Year contender, Cameron Hayley is ready to capitalize on his success as he makes his way to Texas Motor Speedway (TMS) in Fort Worth, for the third time in his young NCWTS career, for Friday night's WinStar World Casino 350k. Making two previous starts at the 1.5-mile track, including a start in the fall race of 2014, the 19-year-old driver has momentum on his side heading to the "Lone Star" state. With a track-best starting position of fifth, in his TMS debut in 2014, and a track-best finish of seventh, earlier this season, Hayley has also led the ultra-competitive NCWTS field for three circuits. Completing 100 percent of the laps attempted (319 of 319), the Alberta, Canada native has spent 146 laps (96.1%) in 2014, and 153 laps (91.6%) in 2015, running within the top-15, proving himself a contender. Hayley, who is within 17 points of fifth-place, Timothy Peters, in the 2015 NCWTS driver points standing, could propel himself even closer to the top-five with another strong weekend at TMS. Already collecting four top-five and 11 top-10 finishes in the 2015 season, the only thing missing from Hayley's resume is his first NCWTS win, and and the "No Limits" track has provided a plethora of first-time winners. In fact, five drivers earned their first NCWTS wins at the Fort Worth track; Bryan Reffner (2000), Travis Kvapil (2001), Brendan Gaughan (2002), Clint Bowyer (2006), and Jeb Burton (2013). Hayley, who has an Average Finish of 8.5, in two starts, looks to add his name to an impressive list of first-time winners following Friday night's 147-lap event. "Texas Motor Speedway is starting to become a more worn out race track. It's getting bumpier, and almost becoming more like a Kentucky (Motor Speedway). In the spring, we weren't as good as we needed to be, but since then, we've been to a lot of other mile-and-a-half tracks. We've really dialed in our trucks, and have gotten that package better. The fact that I've already raced there is going to be a big advantage, and the fact that our trucks are better, I think we have a really good shot at a top-five finish, if not a win Friday night." Chassis Chatter... The No. 13 ThorSport Racing team will utilize chassis No. 53 for Friday's WinStar World Casino 350k at Texas Motor Speedway. This particular chassis has made four appearances in 2015, at Kentucky Speedway in Sparta (ninth), Pocono (Pa.) Raceway (fourth), Chicagoland Speedway in Joliet (16th), and Las Vegas (Nev.) Motor Speedway (10th). Texas Sized Stats... Hayley will return to Texas Motor Speedway for the third time in his young NCWTS career for Friday night's 147-lap event. As the only track on the NCWTS circuit that Hayley will be returning to, with two previous starts, the ThorSport Racing driver has a track-best qualifying effort of fifth (2014) and a track-best finish of seventh (2015). Furthermore, Hayley has an Average Start of 6.6, and an Average Finish of 8.5. Aside from Texas, before 2015, Hayley had experience, on two other NCWTS tracks on the 2015 schedule; Canadian Tire Motorsports Park and New Hampshire Motor Speedway. Rookie Race... Hayley is currently third in the 2015 Sunoco Rookie of the Year battle, recently cutting the deficit to a mere three points behind second-place, Daniel Hemric. Both Sunoco Rookie of the Year contenders are chasing leader, Erik Jones. Previous Race Recap... Showing speed as soon as they unloaded, Hayley posted laps in the top-three in both of Friday's practice sessions at Martinsville Speedway. Qualifying second for the Kroger 200, Hayley showed he belonged at the front of the field. Never falling outside of the top-three during the 200-lap race, Hayley put up a hard-fought battle for his first NCWTS career win, but ultimately came up a couple positions short, in third-place. 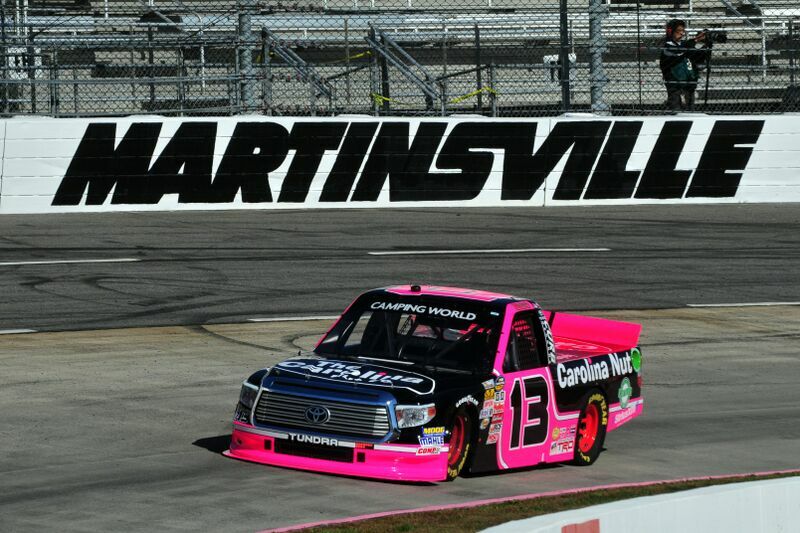 Martinsville, Va. (October 31, 2015) - After posting impressive second and third-fastest times in both of Friday's NASCAR Camping World Truck Series (NCWTS) practice sessions, Sunoco Rookie of the Year contender, Cameron Hayley qualified second for the Kroger 200 at Martinsville (Va.) Speedway, tying his previous career-best starting position. Continuing his stout weekend, Hayley raced his way to a career-best third-place finish in only his second start at the 0.526-mile "paperclip." Battling among the top-two leaders for the first 35 laps of the race, crew chief Jeff Hensley called the No. 13 Carolina Nut Co. Toyota Tundra down pit road during the race's second caution, for four tires, fuel and a track bar adjustment to aid in a "tight" handling Tundra. Restarting sixth, due to three other trucks electing not to pit, the 19-year-old driver quickly made his way back to the front of the field within a couple laps. Trying to chase down the leader for the majority of the race, concern arose for Hayley under the fifth caution period, when his water temperature spiked to 280 degrees. Coached by his crew, Hayley was able to fix the issue from the cockpit, and save what could have been a race-ending problem. Maintaining his top-running position, the Alberta, Canada native complained of a "loose" handling Toyota Tundra, just past the halfway mark, but was able to come down pit road, under caution, on lap 122, for four tires, fuel and an air pressure adjustment to make gains. With six more caution flag periods arising in the final 78 laps of the Kroger 200, Hayley continued to fight as hard as he could until the checkered flag flew. Restarting from the outside lane, under the final restart, Hayley made contact with John Hunter Nemechek, taking him out of contention for the win, and relegating him to a third-place finish, behind race winner, and ThorSport Racing teammate, Matt Crafton. Never falling outside of the top-three throughout the 200-lap event, Hayley had a career-best weekend and a solid points day, moving within 17 points of fifth-place, Timothy Peters. "We ran top-three all day. In fact, we never ran lower than third. It was a good run for this entire ThorSport Racing team, I couldn't be happier with the guys. They had this truck good from the beginning. We were never lower than third in practice even. The racing got rough at the end, but it's just short-track racing. It was a good day of racing for us." Sandusky, Ohio (October 27, 2015) - Securing his 10th top-10 finish of the 2015NASCAR Camping World Truck Series (NCWTS) season last weekend at Talladega (Ala.) Superspeedway, Sunoco Rookie of the Year contender, Cameron Hayley is ready for a change of pace when the NCWTS returns to Martinsville (Va.) Speedway, for the second time in 2015, for Saturday afternoon's Kroger 200. Hayley, who will be sporting the "Maui Onion" peanut flavor onboard his No. 13 Carolina Nut Co. Toyota Tundra this weekend, will return to the .526-mile "paperclip" for just the second time in his young NCWTS career, and the 19 year-old-driver feels more confident about his chances of another successful Martinsville showing. After qualifying third in his debut, in March, Hayley went on to run competitively throughout the entire race. In fact, the ThorSport Racing driver had an Average Running Position of 5.9, ranked second overall, behind NASCAR Sprint Cup Series (NSCS) regular, Joey Logano, according to NASCAR's Loop Data Statistics. Furthermore, Hayley was scored fourth overall in Driver Rating with a 101.2, behind three NSCS regulars; Joey Logano, Kevin Harvick, and Kyle Busch. Unfortunately, a late race restart shuffled the Alberta, Canada native further back in the pack, relinquishing him to an 11th-place finish in his Martinsville debut. After posting three top-five and 10 top-10 finishes, en route to leading 77 laps in his rookie season, Hayley has progressed his way into the sixth position in the 2015 NCWTS driver points standings, just 20 points behind fifth-place, Timothy Peters. The ThorSport Racing driver hopes that he can improve upon his first trip to Martinsville Speedway and continue his success in Saturday's 200-lap race. "I just hope I remember how to break when we get on track at Martinsville (Speedway). I barely touched the break at all last weekend at Talladega, but I'll definitely need it this weekend. I'm excited to go back to a short-track though. That's the style of racing I grew up with. After this season, I'm starting to like racing on the bigger tracks, but I think we'll be really good at Martinsville too. We were pretty decent in the spring, and we went to Sandusky Speedway, earlier this week, to test, and I'm pretty confident in what we are bringing back this weekend." Chassis Chatter... The No. 13 ThorSport Racing team will utilize chassis No. 49 for Saturday's Kroger 200 at Martinsville Speedway. This particular chassis has made three appearances in 2015, at Martinsville Speedway (11th), Gateway Motorsports Park in St. Louis (fifth), and Bristol (Tenn.) Motor Speedway (18th). Testing, 1, 2, 3, Testing... On Monday, Hayley and his No. 13 ThorSport Racing team participated in a one-day test at Sandusky Speedway, in preparation for Saturday's 200-lap event at Martinsville Speedway. Pink Power... When the NCWTS hits the track in Martinsville, Hayley's No. 13 Carolina Nut Co. Toyota Tundra will be sporting new colors. The ThorSport Racing team will don "Maui Onion" pink in support of Breast Cancer Awareness month. Maui Onion peanuts have a hint of island flavor that make an authentic Hawaiian treat. For a list of all 13 flavors visit, www.CarolinaNut.com. Martinsville Stats... Hayley will return to Martinsville Speedway for only the second time in his young NCWTS career. Making his debut on the .526-mile track earlier this season, Hayley qualified third and raced to an 11th-place finish. According to NASCAR's Loop Data Statistics, Hayley ranks second overall in Average Running Position (5.9), and fourth overall in Driver Rating (101.2). Before 2015, Hayley had experience on three NCWTS tracks on the 2015 schedule; Canadian Tire Motorsports Park, Texas Motor Speedway and New Hampshire Motor Speedway. Season Review... After 19 races this season, Hayley has completed 2699 of 2824 laps attempted (95.5%), and led 77 laps en route to three top-five and 10 top-10 finishes. The ThorSport Racing driver currently has a season-best start of third at Atlanta (Ga.) Motor Speedway, Martinsville (Va.) Speedway, and New Hampshire Motor Speedway in Loudon, and a season-best finish of fourth at Pocono (Pa.) Raceway. The ThorSport Racing driver has an Average Start of 8.5, and an Average Finish of 11.5. Rookie Race... Hayley is currently third in the 2015 Sunoco Rookie of the Year battle, 14 points behind second-place, Daniel Hemric. Both Sunoco Rookie of the Year contenders are chasing leader, Erik Jones. Previous Race Recap... After qualifying 16th in his debut at Talladega Superspeedway, Hayley quickly adapted to the high-intensity pack-racing, making his way within the top contenders, running as high as second, and as low as 25th, with an Average Running Position of 11.5. Avoiding a string of late-race cautions, including the "Big One," Hayley raced his way to a sixth-place finish, his 10th top-10 finish of the 2015 NCWTS season.